I have watched you from this window for so long that I have to wonder how often you can go on looking and never seeing. I’m right here in plain sight. Always the same routine with you: every day searching for something that is right before your eyes, stopping to observe as crowds hustle past. I see it in your blank face, your empty expression, the way you stare. You want something more, something to quell the dissatisfaction. But you don’t even know what that something is. Your reflection shimmers with desire as you stand there. If only you weren’t so frozen, unable to move beyond this prison not of your own devising. You let yourself be used, positioned for everyone else’s happiness at the cost of your own. Now you’re on display for the entire world to see, all the while pretending you are invisible, hidden away on the top floor, safe above the masses below. From every angle you are visible, from inside and out. And you don’t even know I’m watching. If you could just tip your head up or tilt it down, a bit to the left, maybe the right, you would see me there as rigid as a soldier yet at ease. Patiently waiting. And never touching, we would share a smile and know that everything will be all right. Instead, you fix your hair, straighten your clothes, stand at perfect, stylish attention, retreat within. It’s time to move on; tomorrow, we will repeat the whole process. Thank you to my dear friend, Rosita Larrson, for allowing me to use her beautiful photography as a visual writing prompt. 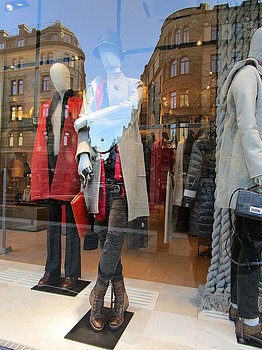 This particular photograph, “Window Shopping,” can be found at Rosita Larrson, fineartamerica, in the gallery titled Mannequins Display Windows Reflections. This is a great story. I wanted to see Rosa’s picture but couldn’t connect to the link. You should definitely take a look at Rosita’s work when you get the chance. Glad you enjoyed the flash fiction.